Last weekend we celebrated the foods of Brazil at the Summer 2013 edition of Moveable Feast. This cuisine is unfamiliar to me but as I researched I came across a recipe for Quindim (pronounced keen-deem) or Brazilian Coconut Flan. I was intrigued and liked that they could be made as little bite-size versions using a mini-muffin tin. Unlike most other Brazilian desserts, this one didn't call for sweetened condensed milk. 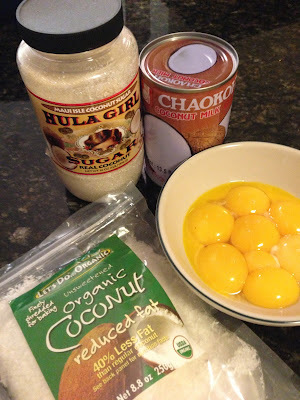 But don't let that fool you, it still had a rich base of egg yolks, sugar, and coconut milk. Unsweetened coconut (I don't have fresh), a little butter, and a little vanilla are all I needed to round out the ingredients. Once all the ingredients were incorporated I poured the batter into a mini-muffin tin. I buttered and sugared the pan using some coconut sugar I got in Hawaii to enhance the coconut flavor. This recipe made exactly 24 mini flan. 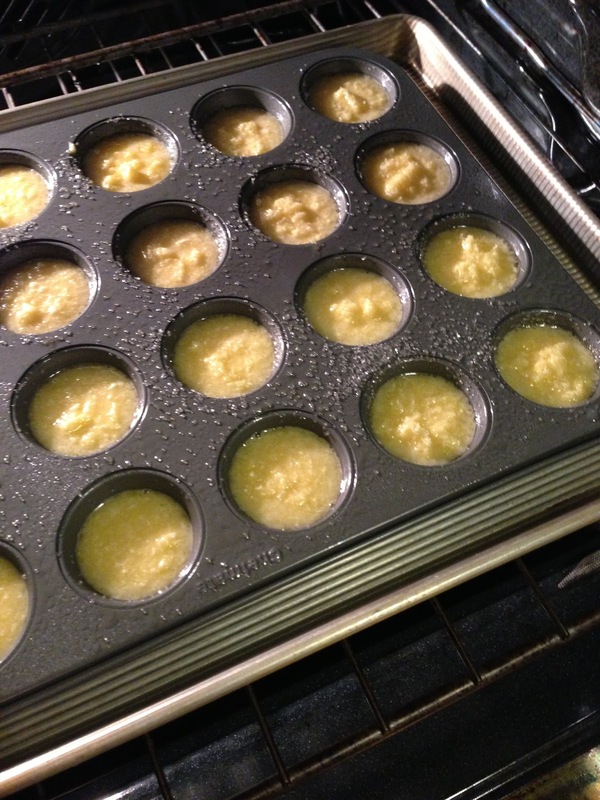 The muffin tin goes into a bain-marie in the oven to bake. I used a jelly roll pan since the muffin tin was so shallow. It was a little tricky not getting water spilled everywhere but otherwise it worked really well. 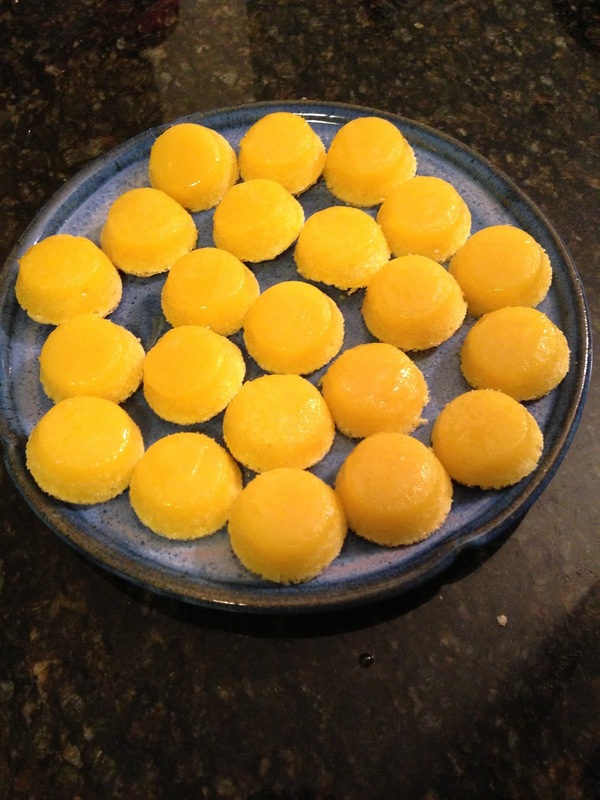 For larger molds the baking time is 45 - 60 minutes. I started at 15 minutes and then checked the quindim every few minutes. When I finally removed them from the oven they were firm and just slightly golden brown. In my oven it was somewhere between 20-25 minutes. As with many things I try for the first time, I wasn't sure that the quindim would come out properly. 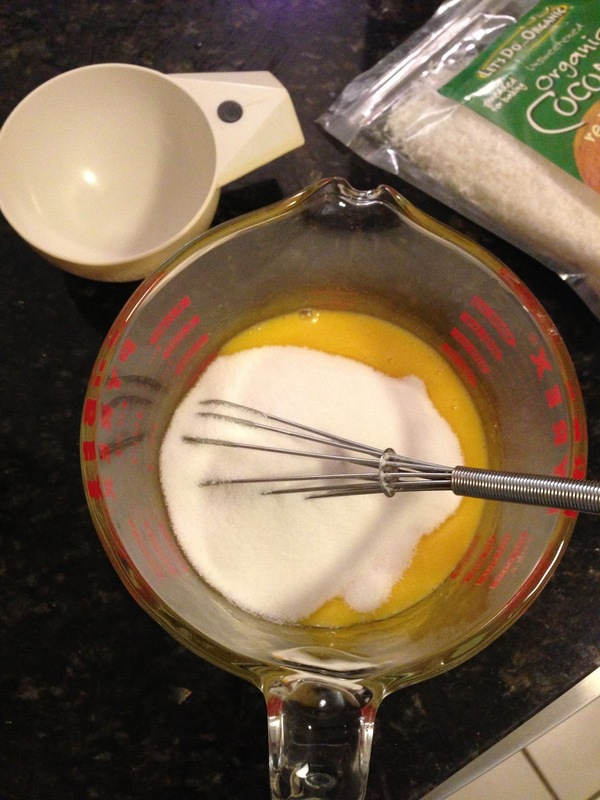 The batter was very pale and didn't look at all like the rich yellow I saw in the pictures. I wondered if it had to do with the eggs that I used. But when they came out of the molds, they were beautiful. 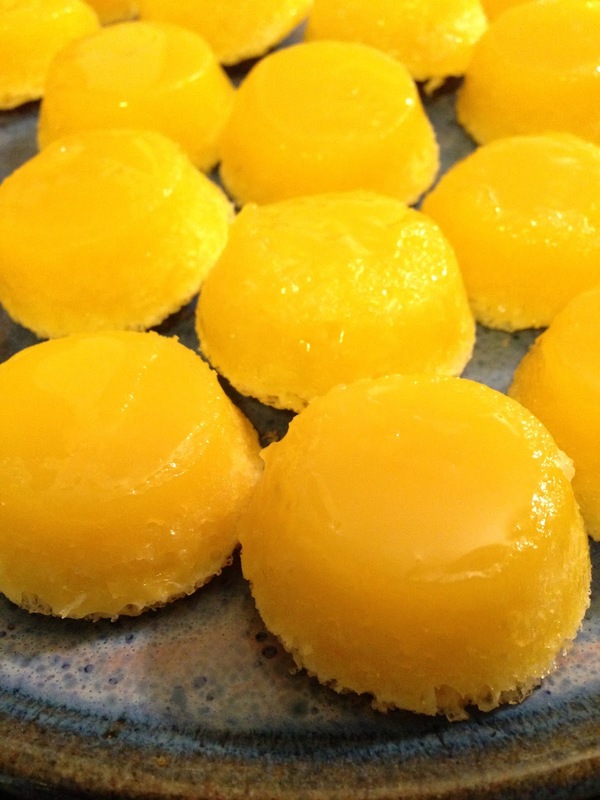 The grated coconut floats to to top of the flan and when they're turned out they act as a crust. It's a beautiful little dessert, a perfectly sized sweet treat after a big meal. Blend all ingredients thoroughly in a bowl. 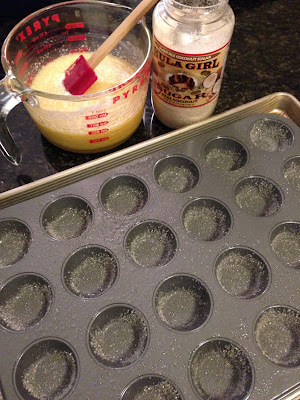 Fill a big baking pan with about 1/2 inch of water and place the molds inside the pan. Bake in the water pan until flan is firm and golden brown (45 - 60 minutes). Remove from oven, cool and remove from molds. Place in paper cups before serving. Run a knife around the edge. If they do not release immediately, chill first.